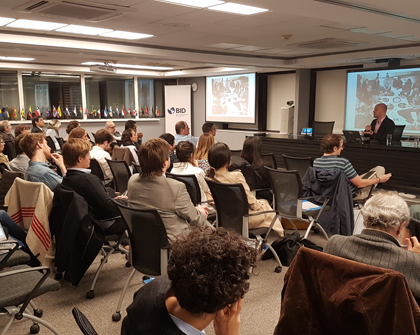 As part of a series of talks being organized by Argentina’s Ministry of Modernization in partnership with INTAL/IDB, a seminar entitled “Challenges to Public Governance and Capacities in the 21st Century: New Skills for Government Employees” was held on May 22, 2017. The speakers at the event included international experts Brenton Caffin, director of Global Innovation Partnerships at the Nesta Foundation, and Emil Bolongaita, the head of Carnegie Mellon University in Australia. The event was presented by Rudi Borrmann, undersecretary of public innovation; Roi Benítez, director of capacity development at the Ministry of Modernization; and Alejandro Ramos, senior economist at INTAL. The aim of the day was to provide training for officials and employees on issues connected with innovation and the challenge of new technologies within government. From its base in the United Kingdom, the Nesta Foundation develops innovation initiatives in areas such as health, education, government, culture, and the creative economy. Mr. Caffin listed the critical qualities that staff need to implement innovation processes within the state. “Over the last 10 years, we have done a lot of research on the skills and capacities that are needed to innovate in the public sector,” said the specialist, who has worked with several governments, including that of Australia. He described the frame of reference that the Nesta Foundation suggests for implementing this type of project. “It’s a snapshot of certain skills that we need to foster in the public sector to allow innovation to flourish, spread, and grow. The big question is: how do we develop and build these skills? We suggest partnering with public administration schools and governments to provide this training,” he argued. Throughout his presentation, Mr. Caffin distinguished between the skills and attitudes that human resources and government officials need to have. The former can be taught through training, while the latter need to be sourced through recruitment strategies. “At the highest level, we see a combination of three skill sets: accelerating learning, working more effectively in teams, and leading change, which implies mobilizing resources and having a certain legitimacy to ensure that things happen. These skills are all very important in the public sector,” he explained. Using this model, Mr. Caffin described the attitudes that were most important for problem solving in the public sector. “The core attitudes for public-sector work include empathy, being action-oriented, curious, brave, results-oriented, agile, resilient, and imaginative. These attitudes are critical in the type of people that we want to involve in innovation projects and teams. They are essential when it comes to recruiting staff and developing the right teams,” Mr. Caffin said. With regard to the skills needed to improve teamwork in the public sector, he stressed commitment to citizens and stakeholders; the ability to engage in genuine dialogue; encouraging people to express their ideas and balance out different voices; and the capacity for building bridges between different sectors that are not usually in contact with one another. The head of Carnegie Mellon University in Australia, Emil Bolongaita, focused his presentation on the transformations that the Fourth Industrial Revolution is bringing about and Argentina’s role in these. “The Fourth Industrial Revolution, which is only just getting started, is driven by discoveries in artificial intelligence, robotics, nanotechnology, 3D printing, the Internet of Things, and online autonomous vehicles,” he argued. “These technologies are increasingly embedded in society and even in human bodies. However, many countries have economic and political institutions whose practices have not changed much since the Second Industrial Revolution. Although the world has made great technological progress, we are still facing the same old problems: poverty, exclusion, terrorism, corruption, ignorance, intolerance, and prejudice. These problems are growing faster than policies and institutions can respond to them,” he reflected.